1. Lightly beat the eggs in a large shallow dish. Whisk in the milk, nutmeg and lemon. Dip the bread slices into the egg mixture for about 30 seconds on each side, then repeat, until all the egg mixture is soaked up. 2. Heat the butter in a large non-stick frying pan over a medium heat until foaming. Add the bread slices and cook for about 2 minutes until golden, then flip the slices over and cook for 1 minute on the other side. 3. 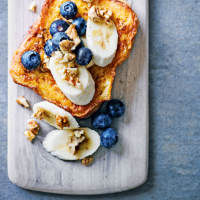 Serve immediately, topped with banana slices, blueberries, walnuts and a drizzle of maple syrup, if liked.